Disposable plastic items are so common that it’s easy not to notice them. 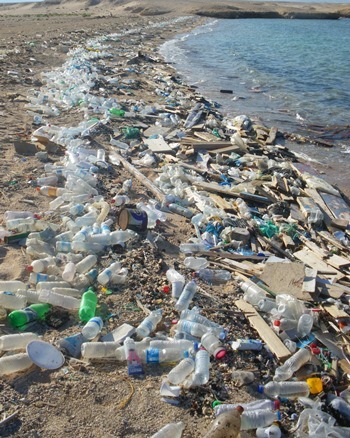 But disposable plastic is everywhere — plastic bottles of water or soda; the plastic straws in our drinks; the plastic bags offered to us at stores; the plastic cups, bottles and utensils at nearly every social event; the plastic packaging of nearly everything in the supermarket. Plastic pollution — it’s simple to just REFUSE. Water: Bring a stainless steel water bottle rather than drinking water out of disposable plastic bottles. Choose stainless steel or glass over aluminum. Don’t have your stainless steel bottle with you? Buy a glass-bottled drink. When you finish that beverage, reuse the bottle or make sure to recycle it. Glass is recycled at much higher rates than plastic. Bring your own bag: Always bring your own bags whenever you shop, not just for the supermarket. By bringing your own bag, you alone can save between 400 and 600 plastic bags per year. And don’t just bring your own tote bags – remember the little bags for your produce and bulk buy items, too! No plastic straw, please: Consider some easy alternatives to the ubiquitous plastic straws that come in nearly every restaurant glass. Carry your own! A pastic littered beach. Pix from commons wikimedia. To-go cups: Bring your own stainless steel or ceramic mug. Carry one in your car. Those cardboard cups often have a plastic lining, so in effect they are plastic. All to-go cups have that plastic lid, a major contributor to plastic pollution. Here are 100 ways to live plastic free, by PPC contributor Beth Terry, author of Plastic Free.